Most people who have a garden are alarmed by the sight of any kinds of insects. The first reaction to bugs is often horror and a decision to use pesticide to protect their flowers and plants against invasions of a variety of insects. This is a natural reaction in a way because there are many insects that feed on leaves of plants and if there are too many of them they can cause serious damage to the garden. However, you should be aware that there are many kinds of insects that are very important for the good health of your flowers and plants. Some of them are good insects! For more about these insects, I suggest The Organic Gardener's Handbook of Natural Insect and Disease Control: A Complete Problem-Solving Guide to Keeping Your Garden and Yard Healthy Without Chemicals by Barbara W. Ellis. Dragonflies are beautiful and colourful and it's nice to see them among the flowers in the garden. They have silk like transparent wings of various sparkling colors. They will eat mosquitoes and many other annoying insect pests that endanger plants. 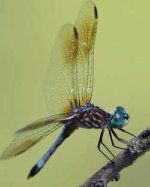 Dragonflies like water and moisture and will be attracted to a garden which has wet soil or maybe a fountain or pond in it. Ladybugs, or Ladybirds, are very pretty bugs with their little red coat and black dots. But Ladybugs are more than just pretty: they are very beneficial to your garden because they eat Aphids! Aphids are very tiny insects; also known as plant lice and they eat the leaves of plants, they live in colonies and they can reproduce very fast. Ladybugs also lay their eggs in these aphid colonies to insure the 'Ladybird' young will have enough to eat when they hatch. Of course not all beneficial insects are as pretty as Ladybugs or Dragonflies. 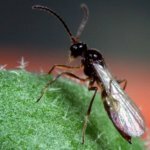 Wasps are thought to be dangerous, but actually there are some wasps that are beneficial for the garden and harmless to humans: the parasitic wasps. Parasitic wasps feast on small worms and harmful creatures that live on flowers. Parasitic wasps like humidity so they will be attracted by moisture the same as the dragonfly. The Praying Mantis is a very interesting insect; many people are fascinated by its looks and size. This insect is so beneficial that it can actually be purchased as an egg and placed on a leaf to hatch. Since Praying Mantis are large in size they can eat big insects that are harmful to plants such as; crickets, large beetles, flies, moths, and so on. 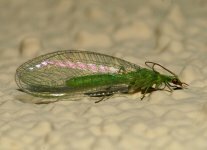 The Green Lacewing is another beneficial insect that is great for natural Aphid control. These pretty insects are very tiny; and they have transparent greenish wings. Since they are very small they can't eat other insects, but they can eat the eggs of insects and thus keep pests such as caterpillars and flies away from flowers and plants. They also consume a large number of Aphids every day. Next time you feel like you want to use pesticides in your garden think twice. Most of these types of chemicals kill not only harmful insects but also those that are classified as being beneficial insects. There are many ways to attract these little helpful gardeners. Some can be purchased and others can be attracted by certain plants or conditions. Beneficial garden insects will help reduce or eliminate the need for toxic pesticides by providing natural pest control in your garden. Buying and releasing beneficial types of insects is the best approach and one that will achieve good results. For example, if you want to get rid of Aphids then it is better to release aphid predators such as Aphids’ Midge and Aphids’ Parasites. To know more about buying and releasing beneficial insects, I suggest you read "The organic gardener's handbook of natural insect and disease control" by Barbara W. Ellis.